My trainer says if you are going to cheat make sure it is ‘Oh heck yeah’ cheat. No lame brownie from a store. No dime ice cream. Something that is really good! Being on day 5 of Jenny Craig this becomes even more important as my cheats are few and far between. Here are 2 recent discoveries and the best thing is they aren’t necessarily that bad of cheats but oh are they good! 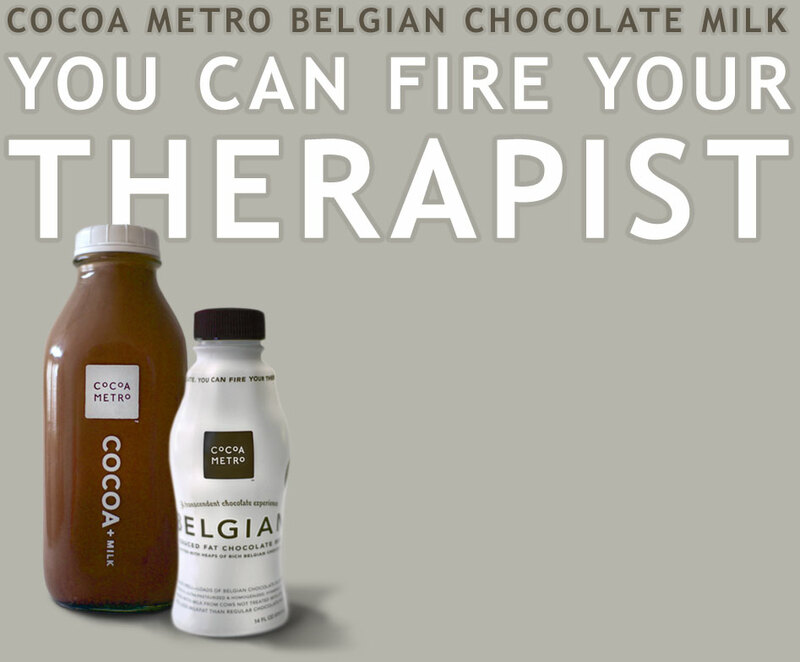 For years I have been on the hunt for the perfect chocolate milk. Almost all chocolate milks have corn syrup and corn starch added in- yuck! It has a gritty, chalky taste to me. I am perhaps hyper-sensitive to that kind of taste. Most people probably don’t even notice it, but it is like runny glue to me. It’s why I hate protein drinks or bars. I have tried so many different kinds and they all set my gag reflex off. (And please don’t tell me that I will like your kind…Heard that before!). I figure people were healthy decades before protein drinks so I can go without! Anyway, I have tried just about every kind of chocolate milk and hot chocolate concoction out there and so far nothing has been able to beat good old Hershey syrup and milk…until today . Holy cow was it good! I like one reviewer said ‘this stuff is crack for chocolate fans’. Another said ““It actually tastes like chocolate—not some weird amalgam of chemicals—with a touch of vanilla to balance it out.”. That is so true. It is strong but still a milk chocolate flavor. The vanilla does come out but mostly it is just chocolate deliciousness. It is thick but not so thick it feels goopy. You can tell the milk is really good too. Some chocolate milks have a background sour milk taste. Not this. Its fresh and creamy. Perfect. Seriously one of the best things I have ever eaten (or drunken. Is that a word? ). I wish I could get the liter jars but it will definitely be in my Harmons shopping cart again. Wish I could buy in bulk! (Luckily I can see the Harmons from my apartment!) Wow! 2. Honeycrisp apples. Every year I live for these apples. 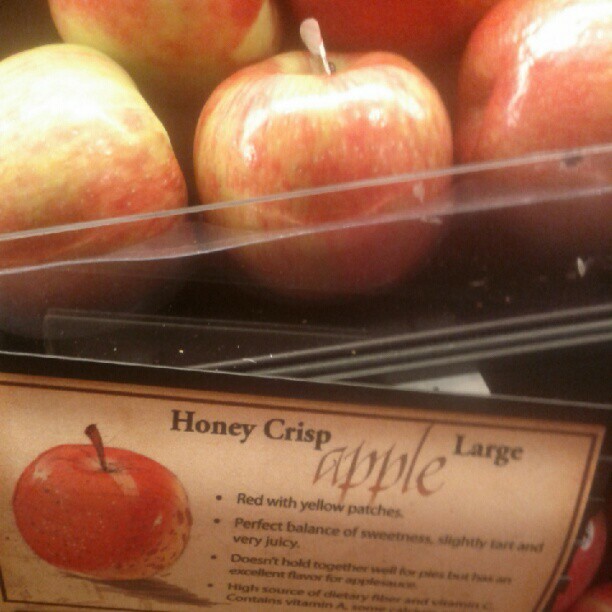 Some apples claim to be ‘like honeycrisp’ (Envy, galla, you know who you are) but alas nothing can beat my honeycrisp. They are a perfect food. Crisp, tart, sweet, delicious. I have literally been dreaming about them for months and anxiously awaiting their return, looking longingly at the apple section but none until today! Last year I gave them away as gifts to friends and once they tasted one they eagerly awaited my next visit and the presentation of the honeycrisp. They are expensive. I spent over $10 on a bag today but worth the price. Holy cow! I literally yelped in the supermarket when I saw them. So while I’m eating my frozen meals I will be supplementing them (its part of the program) with fresh veggies and my delicious honeycrisps! What more can a girl ask for? Seriously hunt these products down. You won’t regret it! Aren’t the simple joys the best? Whoever said you can’t be excited about food and really love it while dieting is crazy!